Borchard P, McIlroy J and McArthur C (2008). Links between riparian characteristics and the abundance of common wombat (Vombatus ursinus) burrows in an agricultural landscape. Wildlife Research 35, 760-7. Breckwoldt R (1983). Wildlife in the Home Paddock. Angus and Robertson, Sydney. Chesterfield EA, Macfarlane MA, Allen D, Hutchinson MN, Triggs BE and Barley R (1983). Fauna and Flora of the Rodger River Forest Block, East Gipps-land, Victoria. Ecological Report 1, Forests Commission of Victoria, Melbourne. Calaby JH (1969). Australian mammals since 1770. Australian Natural History 16, 271-5. Doube LJ (1981). Wildlife diseases of the Pacific Basin and other countries. Proceedings of the 4th International Conference of the Wildlife Disease Association. pp. 63-75. University of California, Davis, California. Ealey EMH (1969). The wombat. Victorian Naturalist 86, 64-6. Gaughwin MG, Judson GJ, the late Macfarlane WV and Siebert BD (1984). Effect of drought on the health of wild hairy-nosed wombats, Lasio-rhinus latifrons. Australian Wildlife Research 11, 455-63. Hornsby PE (1982). Predation of the euro Macropus robustus (Marsupialia: Macropodidae) by the European fox Vulpes vulpes (Placentalia: Cani-dae). Australian Mammalogy 5, 225-7. Horrocks GFB, Opie AM, Carr GW, Cherry KA, Brown GW, Craig SA and Triggs BE (1984). Flora and Fauna Survey of the Ellery Forest Block, East Gippsland, Victoria. Ecological Report 3, Department of Conservation, Forests and Lands, Melbourne. Lawrence GE (1966). Ecology of vertebrate animals in relation to chaparral fire in the Sierra Nevada foothills. Ecology 47, 278-91. Marks CA (1998). Review of the humaneness of destruction techniques used on the common wombat Vombatus ursinus in Victoria: In Wombats. (Eds RT Wells and PA Pridmore) pp. 287-97. Surrey Beatty and Sons, Chipping Norton. Marks CA (1998). Field assessment of electric fencing to reduce fence damage by the common wombat Vombatus ursinus. In Wombats. (Eds RT Wells and PA Pridmore) pp. 298-304. Surrey Beatty and Sons, Chipping Norton. 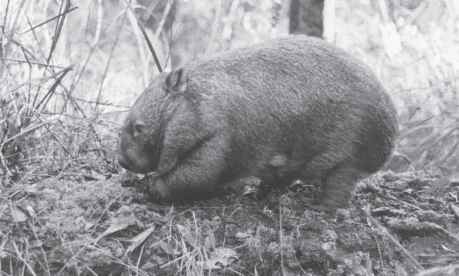 McIlroy JC (1973) Aspects of the ecology of the common wombat, Vombatus ursinus (Shaw, 1800). PhD thesis. Australian National University, Canberra. McIlroy JC (1982) The sensitivity of Australian animals to 1080 poison. III Marsupial and eutherian herbivores. Australian Wildlife Research 9, 487-503. McIlroy JC and Rishworth C (1998). The effect on common wombat Vombatus ursinus populations of replacing native eucalypt forests with plantations of Monterey Pine Pinus radiata. In Wombats. (Eds RT Wells and PA Pridmore) pp. 271-9. Surrey Beatty and Sons, Chipping Norton. Mech LD (1970). The Wolf: The Ecology and Behaviour of an Endangered Species. Natural History Press, New York. Munday BL (1976). Marsupial disease. Proceedings No. 36 for Course for Veterinarians. University of Sydney, Sydney, pp. 335-85. Neal E (1955). Badgers in Woodlands. Forestry Commission Forest Record Leaflet 34, Her Majesty's Stationery Office, London. Newsome AE, McIlroy JC and Catling PC (1975). The effects of an extensive wildfire on populations of twenty ground vertebrates in south-east Australia. Proceedings of the Ecological Society of Australia 9, 107-23. Newsome AE, Corbett LK, Catling PC and Burt RJ (1983). Feeding ecology of the dingo I. Stomach contents from trapping in south-eastern Australia, and the non-target wildlife also caught in dingo traps. Australian Wildlife Research 10, 477-86. Newsome AE (1983). The feeding ecology of the dingo II. Dietary and numerical relationships with fluctuating prey populations in southeastern Australia. Australian Journal of Ecology 8, 345-66. Nicholson PJ (1963). Wombats. Timbertop Magazine 8, 32-8. Opie AM, Cherry KA, Horrocks GFB, Carr GW, Schulz M and Triggs BE (1984). Flora and Fauna Survey of the Yalmy Forest Block, East Gippsland, Victoria. Ecological Report 2, Department of Conservation, Forests and Lands, Melbourne. Pearse RJ (1972). Should the wombat be protected in New South Wales? Parks and Wildlife 1, 61-3. Presidente PJA (1982). Common wombat Vombatus ursinus; maintenance in captivity, blood values, infectious and parasitic diseases. In Management of Australian Mammals in Captivity. (Ed. DD Evans) pp. 133-43. Zoological Board of Victoria, Melbourne. Rishworth C (1990). The effect of the conversion of native forest to plantations of Pinus radiata on the common wombat, Vombatus ursinus (Shaw, 1800). Honours thesis. Australian National University, Canberra. Rolls EC (1969). They All Ran Wild. Angus and Robertson, Sydney. Skerratt LF (1998). Diseases and parasites of the common wombat Vombatus ursinus from the Healesville area of Victoria. In Wombats. (Eds RT Wells and PA Pridmore) pp. 317-28. Surrey Beatty and Sons, Chipping Norton. Skerratt LF (2004). The effects of sarcoptic mange on the behaviour of wild common wombats (Vombatus ursinus). Australian Journal of Zoology 52 (3), 331-9. St John BJ and Saunders GM (1989). Plan of management for the hairy-nosed wombat (Lasiorhinus latifrons) in South Australia. Report published by the South Australian Parks and Wildlife Service, Department of Environment and Planning, South Australia. St John BJ (1998). Management of southern hairy-nosed wombats Lasiorhi-nus latifrons in South Australia. In Wombats. (Eds RT Wells and PA Prid-more) pp. 228-42. Surrey Beatty and Sons, Chipping Norton. Taylor AC, Alpers D and Sherwin WB (1998). Remote censusing of northern hairy-nosed wombats Lasiorhinus latifrons via genetic typing of hairs collected in the field. In Wombats. (Eds RT Wells and PA Pridmore) pp. 156-64. Surrey Beatty and Sons, Chipping Norton. Tenby ID (1998). The law and wombats in Australia. In Wombats. (Eds RT Wells and PA Pridmore) pp. 305-11. Surrey Beatty and Sons, Chipping Norton. Triggs BE, Brunner H and Cullen JM (1984). The food of the fox, dog and cat in the Croajingalong National Park, south-eastern Victoria. Australian Wildlife Research 11, 491-9. Tyndale-Biscoe H (2005). Life of Marsupials. CSIRO Publishing, Melbourne. Wildlife Act (1975). Victorian Government Gazette 84, 2740. Wunschmann A (1970). Die Plumpbeutler (Vombatidae). A Ziemsen Verlag, Wittenberg Lutherstadt.